Great haul! I've heard great things about all 3 of these. Enjoy your new books. Happy reading! All three are books I want to read and have heard good things about. Enjoy! I loved Arclight and I did enjoy Forsaken as well! Through to you looks awesome as well! Through to You looks like a really good book! Can't wait to hear your thoughts on it. I'm really looking forward to Arclight. It has a stunning cover. I hope you love it. Really want to read Arclight! Hope you enjoy all of your books! 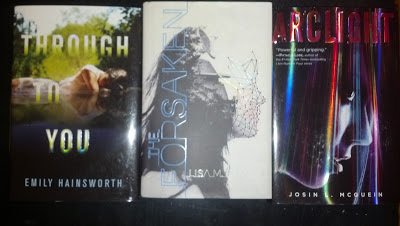 Ooh I've heard good things about Forsaken and Arclight - really hope you enjoy them! :-) And have a lovely week! These books look great and I've heard some good things about them especially Forsaken and Arclight! Hope you enjoy them! light sources and radiofrequency devices. I have reviewed every popular acne product for you on my website, so you don.